Sabahou el kheir! 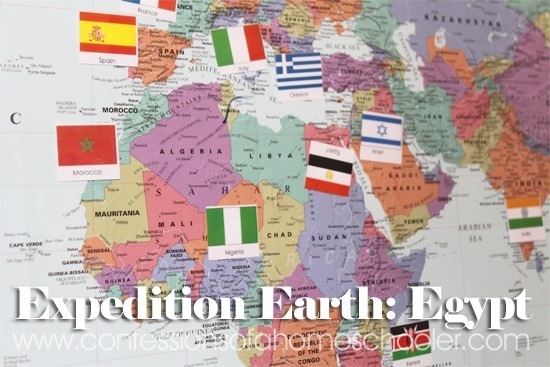 Welcome to our Expedition Earth week on Egypt! Visited an Egyptian mummy in real life! Everyone’s been looking forward to this week because we were planning to do a mummy experiment. And I’m not sure about your kids, but when the word “mummy” comes up, everyone gets excited! But first…we had to stamp our passports so we could continue on our journey! 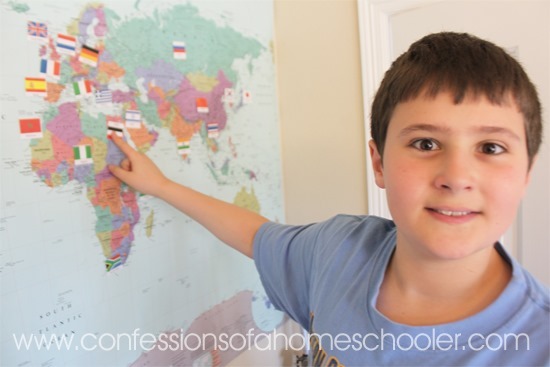 We started off by reviewing all the countries we’ve learned so far, then added the Egyptian flag to our wall map. Next we moved on to our mapping project. 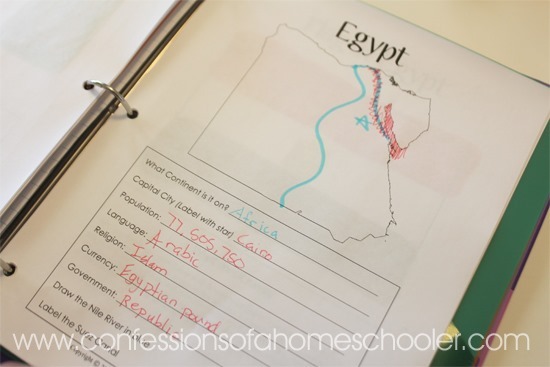 We discussed the Sahara desert, the Nile river and learned some cool facts about Egypt. Did you know that the Nile River, which runs 4,258 miles long, is known as the longest river in the world? It’s waters are shared by eleven countries and it is the primary water source of Egypt and Sudan. Egypt is known as the “gift of the Nile” as it’s silt deposits made the surrounding land fertile allowing Ancient Egyptians to cultivate and trade wheat, flax, papyrus, and other crops. 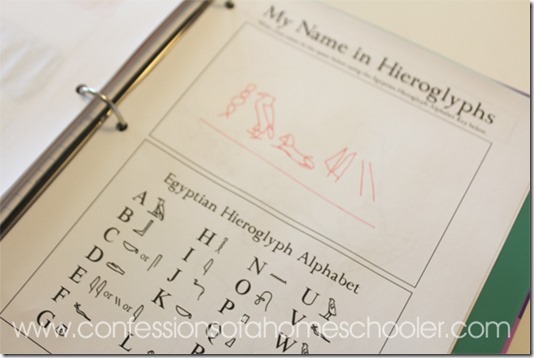 We also learned about the Egyptian flag and colored our worksheet. 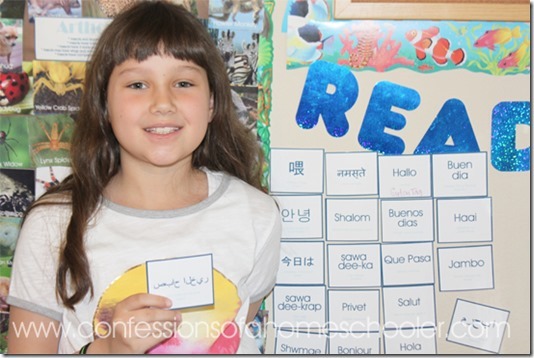 We learned how to say hello in Arabic, and added our card to our hello word wall. 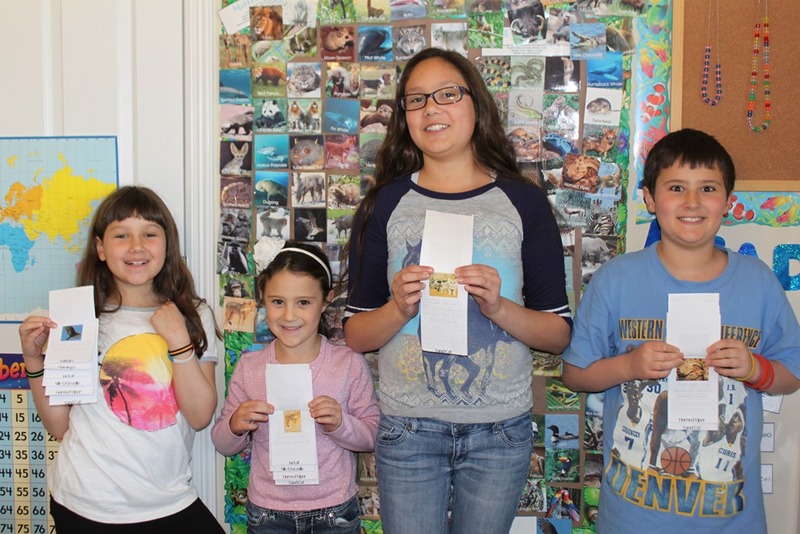 We also made some fun post cards to send to the folks back home. Or show dad when he got home. Either way, they were fun..
We learned how to write our names in hieroglyphs. We also looked up some information on the country in our Usborne Encyclopedia of World Geography. We also find the country and practice our mapping skills using the maps provided in this book as well. We had a lot of fun activities this week, but one simple idea that was a HUGE success, was the scarab stone craft. 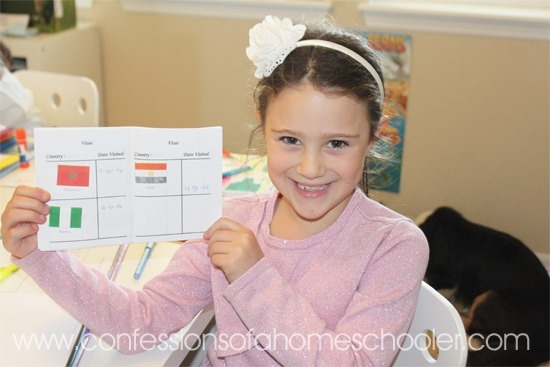 The kids went outside and gathered some nice smooth oval shaped rocks, then we used colored sharpies to color them. I still find these things all over the house! Scarab stones were generally either carved from stone or molded from Egyptian faience. Once carved, they would typically be glazed blue or green and then fired. The most common stone used for scarabs was a form of steatite, a soft stone which becomes hard when fired. I forgot to get pics this time around, so here’s one of my oldest back in 2010 when we did Expedition Earth the first time. They all still color rocks regularly! 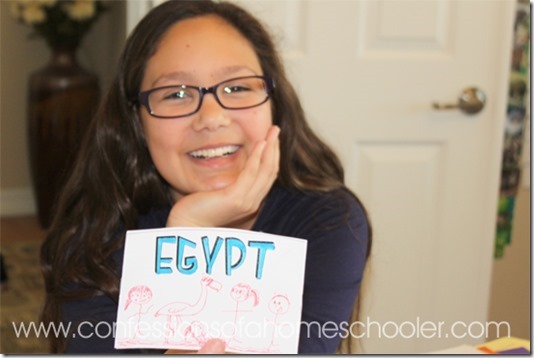 We learned about 6 fun animals found in Egypt, here are our favorites…I’m not sure what’s up with the faces, but as we progress through our expedition, they seem to be getting crazier and crazier. Of course a tour through Egypt wouldn’t be complete without learning about the Great Pyramid of Giza! We used Flora Craft Styrofoam Bricks to make ours. We learned that building a pyramid was harder than it seemed! I didn’t want to waste bricks by making full layers for each level, so we glued a couple layers then let it dry then glued a few more. This took forever, and our pyramid got a little deformed along the way! I don’t know how those Egyptians did it! And probably one of our favorite parts of the week came on Apple Mummification Day! The kids did a great job weighing their apples, then measuring their mixtures. Everyone was excited to see results! Click here for more details on the Apple Mummification project, and instructions are of course included in my Expedition Earth curriculum. It was totally cool that our local museum of nature and science happened to have a King Tut display open! We actually visited this a few weeks back just to make sure we didn’t miss it. The kids got to see a real mummy, and learn a little about the process. Kind of gross, but they loved it! 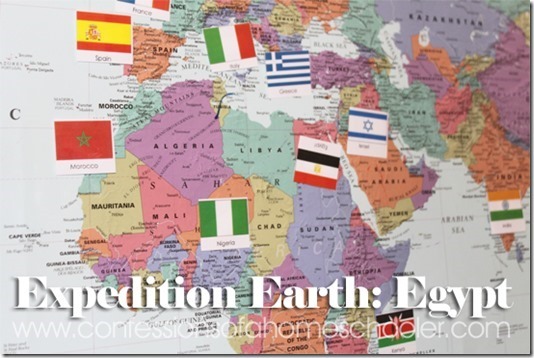 Click here if you’d like to follow along with our Expedition Earth Geography Curriculum Journey! 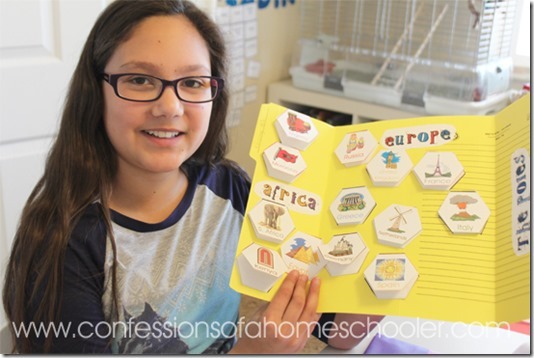 Expedition Earth is a hands on world geography curriculum that covers 31 countries across the world. 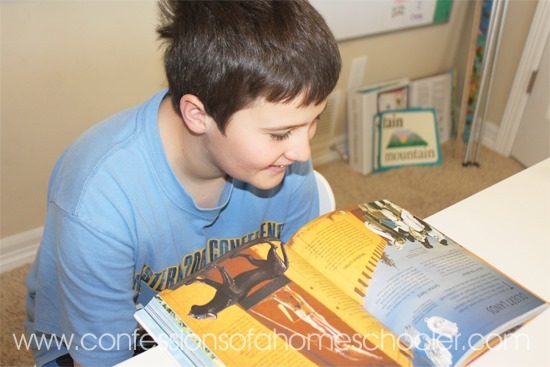 It is designed primarily for K-5th grade students. 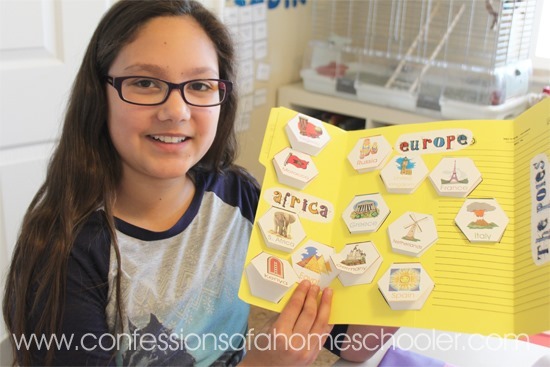 Students will learn the continents, oceans, people, cultures, animals, climates, try new foods, crafts and more, all through hands-on activities! Erica I have a question I’d love your advice on. I’m exploring curriculum options for social studies for my daughter (grade 2) and son (kindergarten) for next year. Is this Expedition Earth program designed to take the whole year? I’m trying to figure out if I would do this program as Geography and then also do a formal history program (ie History Odyssey/Story of the World) which seems like alot? Or would EE be enough to cover both subjects? Any feedback you could offer would be much appreciated!